At J&J we approach your house as a ‘system.' Our auditor will do a thorough examination of how that system interacts and where the system is not functioning optimally. In order to perform a comprehensive energy analysis, J&J uses Infra Red and Blower Door technology. After visually inspecting the home, a scan is done with an Infra Red Camera to determine whether voids exist in the thermal boundary. 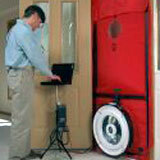 A Blower Door test is then used to assess the overall ‘air tightness’ of the building envelope. The blower door pressurizes the home, forcing air through all holes and penetrations that are connected to the outside, making those problem spots easier to find. Zonal testing with the blower door is done to measure the amount of leakage between the conditioned areas of the house and unconditioned areas such as attached garages, attics, knee walls and crawlspaces. If the home has a forced air system, the blower door is used to measure the amount of air leakage in the system. Duct leakage is heated or cooled air leaking in to unconditioned spaces (ie attic and crawl areas). For health and safety concerns, the auditor also evaluates the functionality of all ventilation equipment (i.e. flues, bath exhausts, and range hoods) and tests for the presence of carbon monoxide in homes with combustion appliances. A detailed report is written up and recommended solutions are prioritized for the best ‘bang for the buck’.